The Autry Museum of the American West—"the Autry"—brings together the stories of all peoples of the American West, connecting the past with the present to inspire our shared future. Co-founded in 1988 by Jackie and Gene Autry and Joanne and Monte Hale, the Autry has grown to encompass a broad and inclusive representation of art, artifacts, cultural materials, and library holdings. In 2002, the Autry merged with Women of the West, a nonprofit organization highlighting the impact of diverse women’s experiences on the history of the American West. In 2003, after many years of being on the verge of financial insolvency and with the collection and buildings in need of significant care and investment, the Southwest Museum of the American Indian sought a merger with the Autry Museum of Western Heritage, and a new organization was formed (now known as the Autry Museum of the American West). The Autry's diverse collections include more than 600,000 artifacts, artworks, and archival materials that reflect the interconnectedness of cultures and histories in the American West. The Autry Museum in Griffith Park, originally the Gene Autry Western Heritage Museum, was co-founded by Jackie and Gene Autry and Joanne and Monte Hale. With the opening of the Museum in 1988, Gene Autry realized his dream "to build a museum which would exhibit and interpret the heritage of the West and show how it influenced America and the world." Attracting between 150,000 and 200,000 annual visitors, the Autry in Griffith Park presents a wide range of special exhibitions and public programs that explore the art, history, and cultures of the American West. The Historic Southwest Museum Mount Washington Campus is the original location of the Southwest Museum of the American Indian, the oldest museum in Los Angeles, and was founded by Charles Fletcher Lummis. In 2015 the National Trust for Historic Preservation named the historic site a National Treasure, launching a collaborative process to identify a long-term sustainable future for this Los Angeles landmark. >Learn more about this process and see our FAQs. The Autry is in the process of revitalizing a structure that will ultimately be a new, state-of-the-art, 100,000-square-foot Resources Center in Burbank to preserve its collections for generations to come. Utilizing sophisticated environmental controls and employing best-practice conservation solutions, this center will have the technology and equipment essential to properly care for, protect, and preserve the range of objects and library materials within the Autry's collections—everything from baskets and beadwork to firearms and saddles. When it opens, this center will serve as a destination where students, scholars, artists, archaeologists, tribal representatives, and the broader public can experience the breadth of the Autry's collections. Gene Autry's career spanned some 60 years in the entertainment industry, encompassing radio, recordings, motion pictures, television, rodeo, and live performances. He was an astute businessman whose range of interests encompassed ownership of radio and television stations, hotels, music companies, and the Angels Major League Baseball team. Known as "America's Favorite Singing Cowboy," he is the only entertainer to have five stars on Hollywood's Walk of Fame: one each for radio, records, film, television and live theatrical performance (including rodeo). In his ability to transcend media and in the sheer scope of his output, Gene Autry was unsurpassed as a popular image-maker of the American West. Born in Tioga, Texas, on September 29, 1907, Orvon Gene Autry bought his first guitar at the age of 12 for $8. By the late 1920s, he was working as a telegrapher for the railroad in Oklahoma. While he was singing and playing in the office one night, Gene was discovered by the great cowboy humorist Will Rogers. Rogers advised the young Autry to try radio, and the rest is history. Gene Autry is the only entertainer to have five stars on Hollywood's Walk of Fame, one each for radio, records, film, television and live theatrical performance. Gene Autry began his radio career in 1928 and made his first recordings a year later. His first hit came in 1931 with That Silver-Haired Daddy of Mine, the first record ever certified gold for having sold more than a million copies. Gene made his film debut as a dude ranch cowboy singer in the 1934 Ken Maynard film In Old Santa Fe. In 1935, he made his first starring appearance in the science fiction Western serial The Phantom Empire. By 1937 he was America's Favorite Cowboy, voted the "Number 1 Western Star" by the theater exhibitors of America. In 1940 the theater exhibitors voted Autry the fourth biggest box office attraction, behind Mickey Rooney, Clark Gable, and Spencer Tracy. Autry remained in first or second place among cowboy stars in terms of box office draw until he retired from motion pictures in 1953. He appeared in 93 feature films and made 635 recordings, more than 300 of which he wrote or co-wrote. Some of his best known movies are based on his hit records, including South of the Border (1939), Mexicali Rose (1939), Back in the Saddle (1941), The Last Round-Up (1947), and Strawberry Roan (1948). Gene's recordings have sold more than 60 million copies and brought him more than a dozen gold records. Be Honest With Me was nominated for an Academy Award in 1941. Gene Autry's beloved Christmas and children's records Here Comes Santa Claus (1947) and Peter Cottontail (1950) went platinum for more than two million copies sold, while Rudolph the Red-Nosed Reindeer (1949) remains the second best-selling single of all time, with sales totaling more than 30 million. In addition to his movie and recording success, Gene Autry's Melody Ranch was heard weekly over the CBS Radio Network between 1940 and 1956. During World War II, Autry enlisted for service on the air during a broadcast of the show, going on to serve his country as a flight officer with the Air Transport Command. From 1943 until 1945, he flew large cargo planes in the China-Burma-India theater. When the war ended, Autry was assigned to Special Services, where he toured with a USO troupe in the South Pacific before resuming his movie career in 1946. By 1937 he was America's Favorite Cowboy, voted the "Number 1 Western Star" by the theater exhibitors of America. In 1940 the theater exhibitors voted Autry the fourth biggest box office attraction, behind Mickey Rooney, Clark Gable, and Spencer Tracy. Realizing that the days of the B-Western were numbered, in 1950 Autry became one of the first major movie stars to move into television. For the next five years, he produced and starred in 91 half-hour episodes of The Gene Autry Show, as well as producing such popular TV series as Annie Oakley, The Range Rider, Buffalo Bill Jr. and The Adventures of Champion. In the late 1980s, Gene and his former movie sidekick Pat Buttram hosted 93 episodes of the 90-minute Melody Ranch Theatre Show on Nashville Network, spotlighting the telecasting of his old Republic and Columbia movies. The show was one of the highest rated programs on TNN. Gene Autry's great love of baseball prompted him to purchase the American League's California Angels (now the Los Angeles Angels) in 1961. As was his trademark, through the team, Gene provided the fans with quality entertainment. Long active in Major League Baseball, Autry held the title of Vice President of the American League until his death. He was a 33rd Degree Mason and Honorary Inspector General and was given the prestigious award of the Grand Cross of the Court of Honor. Among the many hundreds of honors and awards Autry received were induction into the Country Music Hall of Fame; the American Academy of Achievement Award, the Los Angeles Area Governor's Emmy from the Academy of Television Arts and Sciences; and the Board of Directors Lifetime Achievement Award from the International Achievement in Arts Foundation. 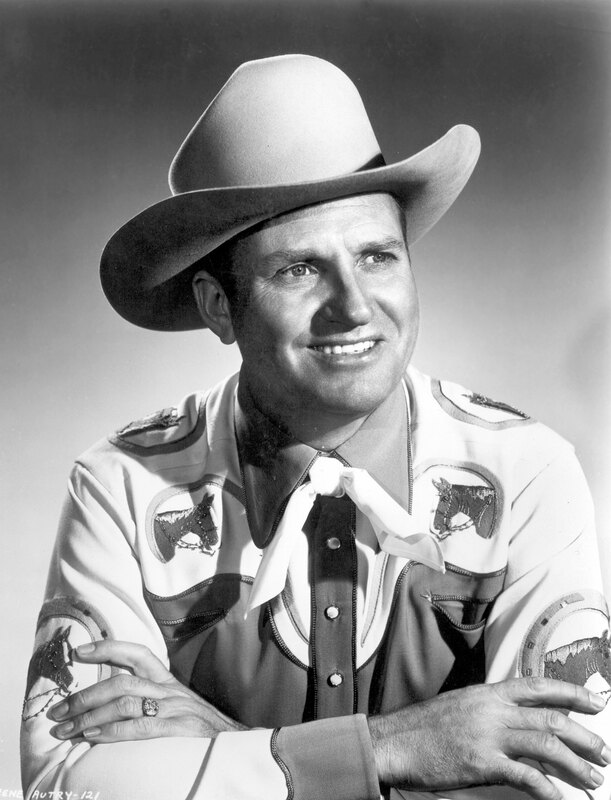 Gene Autry also was inducted into the Nashville Songwriters' Hall of Fame, the National Cowboy Hall of Fame, and the National Association of Broadcasters Hall of Fame. He received the Songwriters' Guild Life Achievement Award and the Hubert Humphrey Humanitarian of the Year Award. He was honored by his songwriting peers with a lifetime achievement award from ASCAP. Gene Autry's long-cherished dream came true with the opening of the Gene Autry Western Heritage Museum in November of 1988, since acclaimed as one of the finest museums on the West. Autry intended to give something back to the community that had been so good to him. Today thousands of visitors, children, and adults alike, learn the fascinating history of America's West through the Autry's world-class collections of art and artifacts. The Southwest Museum of the American Indian was the brainchild of Charles Fletcher Lummis, a journalist, photographer, amateur anthropologist, and prolific historian of the southwestern United States. In 1903, Lummis organized the Southwest Society, the western branch of the Archaeological Institute of America, whose mission was to create "a great, characteristic Southern California museum." He garnered support among the city's financial elite, and in late 1907, he chartered Los Angeles's first "free public museum of science, history, and art." When the new museum opened in 1914, it included halls of conchology and Asian and European art, along with displays of Southwestern and California archaeological materials, the Munk Library of Arizoniana, and the Lummis Library. In the 1920s the Southwest Museum narrowed its focus to anthropology and its subject matter to the cultural history and prehistory of the indigenous peoples of the Americas. By building on the work begun by the Southwest Society, which had sponsored Edgar Lee Hewett's early excavations in New Mexico, the museum set about becoming a leader in Southwest, and later Great Basin, archaeological research. In 1903, Lummis organized the Southwest Society, the western branch of the Archaeological Institute of America, whose mission was to create "a great, characteristic Southern California museum." Museum staff and research associates, including Charles Amsden, Monroe Amsden, A. V. Kidder, Sylvanus Morely, and James A. B. Scherer, participated in the first Pecos Conference in 1927. Between 1925 and the mid-1960s, the Southwest Museum sponsored archaeological investigations in Casa Grande, Arizona; the Mimbres area in New Mexico; Mesa House and Gypsum, Nevada; and Twentynine Palms, California, among others. Learn more about Lummis through KCET's website or CharlesLummis.com. In 2002 the Women of the West® Museum merged with the Autry, creating a gathering place for programs, exhibitions, collections, research, and education dedicated to diverse women's experiences in the American West. Our goal is to gain a new understanding, not simply of what women have done but of why it matters for the West—past, present, and future. Founded in 1991 in Boulder, Colorado, the Women of the West Museum was the first museum in the nation dedicated to the history of women of all cultures in the American West. Committed to education outside traditional museum walls, theWomen of the West Museum broke new ground with its innovative use of online exhibitions, community partnerships, women's history trails, and art-based humanities programs. The merger with the Autry reflected a continuation of its original spirit, while providing a physical home in Los Angeles to continue its vision through new exhibitions and programs integrated into an overall vision of the West. Dr. Scharff has written numerous works about the history of women in the United States. At the Autry she works with Dr. Carolyn Brucken, Curator of Western Women's History, to develop exhibitions and programs about women and gender, including Home Lands: How Women Made the West. Painting by Henri Penelon, PORTRAIT OF A GIRL, 1860s. Portrait of a young member of the Sepúlveda family, dressed in the latest American style of the time. Brown, gold, yellow, red and orange cotton quilt titled LATE FALL TIME made by Josephine Red Elk, a Lakota Sioux woman, circa 1970s-1990s. Photograph by Frank J. Haynes of sixteen unidentified women in Yellowstone National Park, 1890s. Bulto by Gloria Lopez Cordova of Nuestra Señora de los Dolores, 1990. Inuit child's sealskin moccasins, upper made from green felt or flannel with beaded floral design, lined with flannel, collected Alaska, acquired by the Museum 1930. Sewing box with two sections inlaid with exotic woods imported from Hawaii, South American and Asia, late 1700s. Photograph of a family portrait in Chinatown, San Francisco, California, late 1800s to early 1900s. Woman's turquoise cotton dress with multi-colored embroidery and gold lame jacket designed and made by Guido F. Miele, circa mid-1940s. Wood acoustic guitar made by the Larson Brothers, circa 1937. Made for Patsy Montana at her request for a guitar similar to a Martin guitar. This became one of the brands of guitars the Larsons made along with the Maurer and Prairie State. Woman's blue and white buckskin dress made by the Sioux Indians, circa 1900. Navajo First Phase chief-style blanket (beeldlei or hanolchadi), 1880-1910. Woman's blue, grey and brown striped silk and velvet outfit (bodice, skirt) handstitched by Janette Sherlock Smith, 1875. Navajo weaving by D.Y. Begay, BLACK MESA, 2005. C.F. 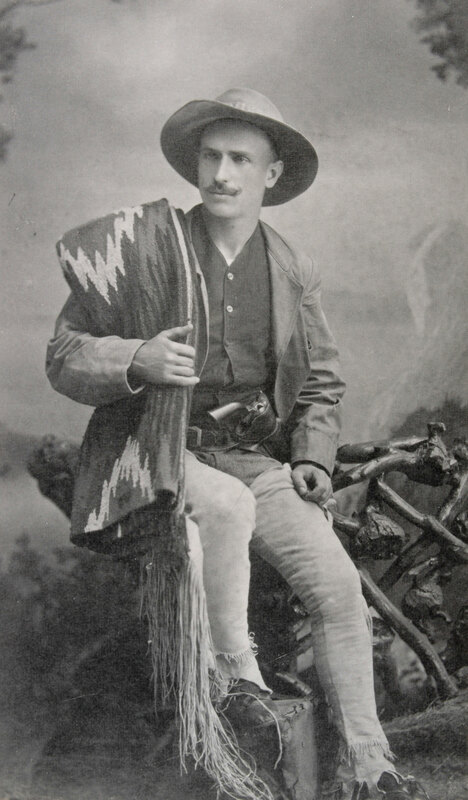 Lummis, age 24, in a studio photograph taken in Los Angeles some time after he completed his “Tramp Across the Continent,” 1884.